In recognition of the holiday season, staff and students from Connetquot Central School District’s Cherokee Street Elementary School recently came together to collect various food items to benefit less fortunate families of the Cherokee community. 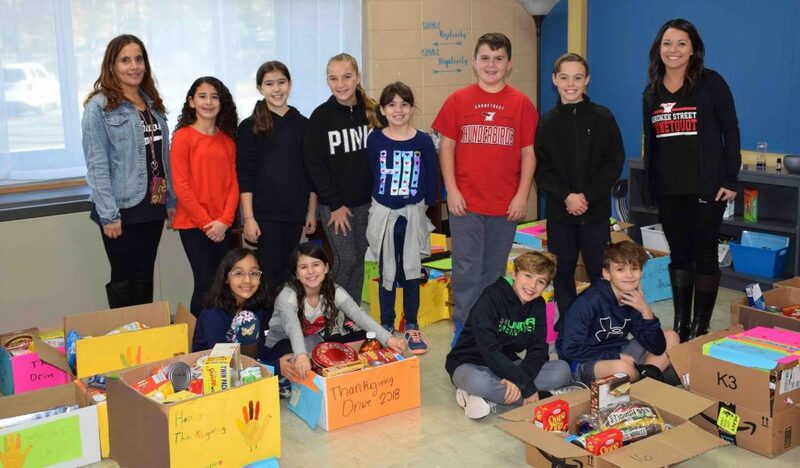 With assistance from Youth and Family Services Coordinator Nicole Coogan and teacher’s aide Nicole Masi, the fifth-grade peer leaders were able to fill about 20 boxes to the brim with holiday essentials such as stuffing, pie crust and mashed potatoes. The school would also like to thank the teachers of Cherokee Street Elementary for donating enough turkeys to ensure that every family has one to enjoy on Thanksgiving. Due to the generous number of holiday foods collected, all extra items are going to be donated to a local food pantry to benefit other families in need of a proper holiday meal. Photo caption: Cherokee Street Elementary School’s fifth-grade peer leaders are pictured with Youth and Family Services Coordinator Nicole Coogan (far right) and teacher’s aide Nicole Masi with the food items collected during their holiday food drive.